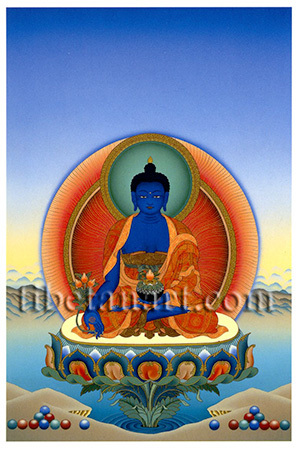 The Medicine Buddha, or Medicine Guru (Bhaisajya-guru), is the form in which Shakyamuni manifested in order to reveal the Medical Tantras. The meditation practice of this deity is believed to cure the afflictions of body, speech and mind. He is also known as the 'King of Vaidurya Light', referring to his radiant and deep blue form, which is like sapphire or blue-beryl (vaidurya). He sits in vajra-posture upon a white moon disc and a multicoloured lotus, wearing the three red robes of a Buddhist monk. His right hand is extended downwards in the boon-granting gesture of supreme generosity, as he holds a triple-fruited branch of a myrobalan tree between his thumb and index finger. His left hand rests upon his lap in the gesture of meditation and supports a blue alms-bowl of vaidurya gemstone, which contains medicinal nectar and another myrobalan fruit. In both the Tibetan and Indian Ayurvedic medical traditions the dried and plum-like fruit of the myrobalan (Skt. arura) is known as the 'King of Medicines'. In the two lower corners are offerings of coloured jewels.